Robert Purvis was born on August 4, 1810 in Charleston, South Carolina, the second of three sons to a wealthy cotton broker and a free woman of color. With the benefits of a financially successful family, Purvis began his opposition to slavery at a very young age. When Purvis was nine, his father moved the family to Philadelphia where Purvis attended the Pennsylvania Abolition Society’s Clarkson School. 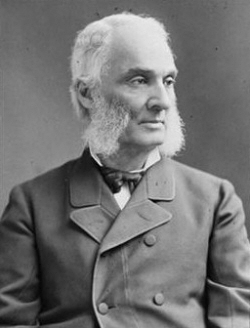 Shortly thereafter, Purvis continued his education at Amherst College in Massachusetts. In 1833, Robert Purvis also helped to establish the Library Company of Colored People as well as the Anti-Slavery Society in Philadelphia, both of which engaged in abolitionist activity. In that same year Purvis also became associated with William Lloyd Garrison’s American Anti-slavery Society and in 1834 traveled to Europe to speak publicly, raise funds and engage in meetings with high ranking European officials in the campaign to end slavery. His luxurious Philadelphia home was now well known for entertaining distinguished abolitionists from both America and from Europe. Purvis remained active in his campaign to repeal Pennsylvania state laws that barred African Americans from voting. In his effort, Purvis drafted the document “Appeal of Forty Thousand Citizens Threatened with Disfranchisement” in 1838. He also served as President of the Pennsylvania Anti-Slavery Society between 1845 and 1850, the first African American to lead a predominately white anti-slavery organization. His political efforts were also directed toward women’s rights, prison reform and prohibition. In 1883 Robert Purvis presided over the ceremonious 50 year anniversary meeting of the American Anti-Slavery Society. Purvis died in Philadelphia on April 15, 1898. Kwame Appiah and Henry Louis Gates, eds., Africana: The Encyclopedia of the African & African American Experience, Vols. 1-5 (New York: Basic Civitas Books, 2004); Margaret Bacon, But One Race: The Life of Robert Purvis (New York: Albany State University press, 2007); Herb Boyd, Autobiography of a People: Three Centuries of African American History Told by Those Who Lived It (New York: Doubleday, 2000). History Told by Those Who Lived It (New York: Doubleday, 2000).